Truth be told, I ate so much of the Shrimp Pickle Appetizer as I was photographing it, so what you see is one of the last ones in the photo. This is based on my mom’s recipe for shrimp pickle which I used to devour. And by devour, I mean eat it like a glutton. She made it like a curry that could be eaten with the chappati bread or with warm fluffy rice! I thickened the curry with some besan flour to use it as an appetizer. So the ‘curry’ is thick enough to stick the veggies in. The shrimp pickle is not for the faint hearted- it is spicy, just like most of the Indian pickles are. So with all the colorful, tender veggies out in the spring, I wanted to try juxtaposing the pickle with the veggies. They cut down on the heat and went very well with the shrimp.It also makes us feel good that we have eaten our vegetables for the day:) I used the prebaked, ready to fill phyllo shells which add the crispy crunch to the dish. To the cleaned shrimp, add the turmeric powder,1 teaspoon of the pickle masala, the grated garlic , ginger and the sea salt. Set it aside to marinate for a few minutes. Dredge the shrimp in the besan flour. In a separate pan, heat the oil over medium heat. Add the mustard seeds and the asafetida powder. 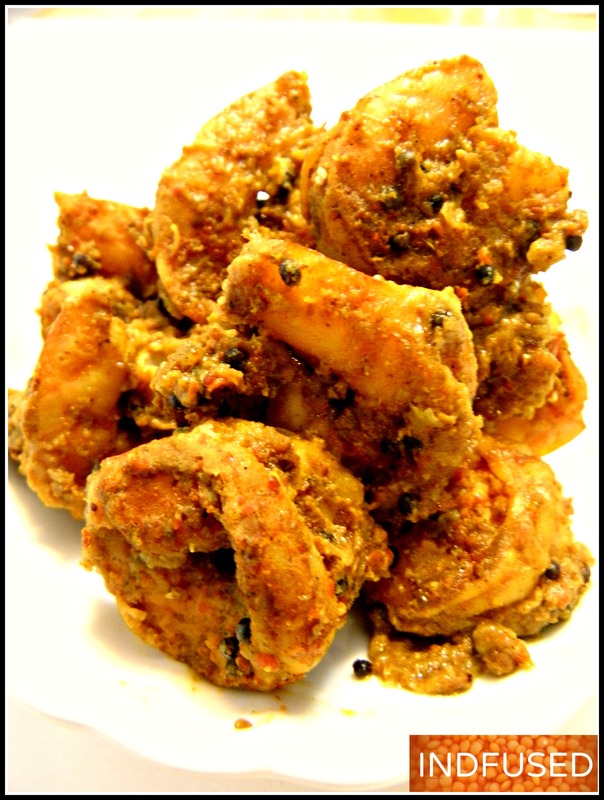 When it sizzles, add the ½ teaspoon of pickle masala and stir for a brief second. Add the shrimp and stir fry it until opaque. Add the tamarind pulp along with the soaking water ,stir and let the shrimp cook, about 2 to 3 minutes longer. Adjust the salt, if needed and remove from heat. Let it cool to room temperature. Serve along with the veggies in the phyllo cups. Hope you enjoy munching on them as much as I did! 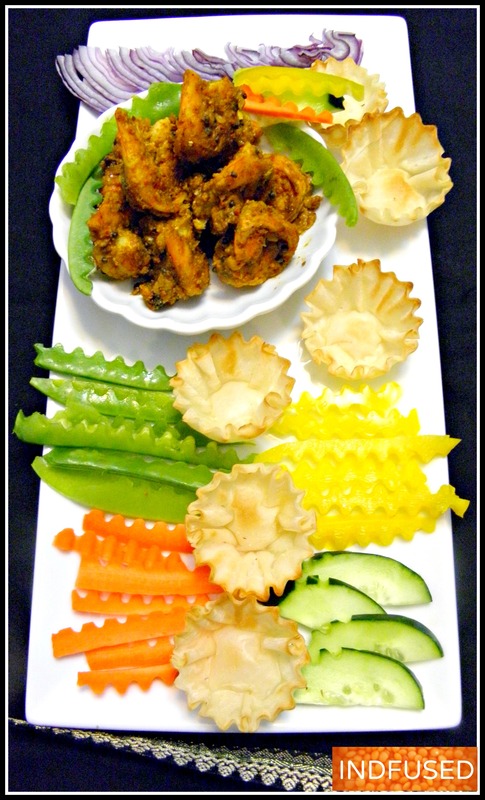 I am taking this Shrimp Pickle appetizer to the fun fiesta at Angie ‘s at her new site FiestaFriday.net. Congratulations Angie and I hope you feel better soon. It is co hosted by Margie and Selma. Thank you ladies! I just purchased some asafetida and am looking for ways to use it. What flavor does it add to the dish? This looks delicious, I think I would have had to make a double batch if I wanted lanyard left. Love, love, love this appetiser! Looks too good to eat! The combo of shrimp & the pickle spices is awesome! And of course, your blog is AMAZING!!! You are so kind, Jeanette. I am so glad I found you on FF too! You have an awesome blog! I am new to blogging and still trying to get a hang of twitter and instagram etc.. I sincerely appreciate your compliments about my blog! 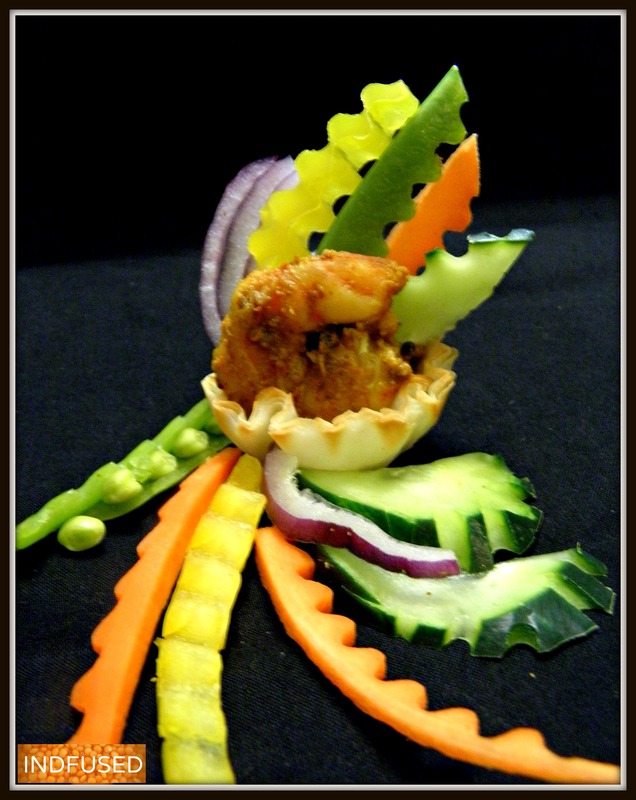 What an innovative use of pickle spice, besan and prawns! Love this idea and also adore the presentation – they would be perfect with pre dinner drinks! Thanks so much for sharing and Happy Fiesta Friday! Thank you so much Selma! What a great compliment coming from an amazingly talented person that you are. I am new to blogging and admire awesome blogs like yours ! What a presentation! I’m so bad at making my dishes nice… you seem to be very talented! Thanks for being at FF with these gorgeous appetizers! Margherita,I thank you for the compliment but beg to differ about your presentations. They are simply awesome. I feel like reaching and grabbing those yummy rosemary and raisin buns and the Cocoa tart with white chocolate ganache and passion fruit jelly is simply a work of art! It’s alway this way… we are never satisfied about what we do…. thanks a lot for your kind reply, very much appreciated! The presentation looks really nice – perfect snack for party! Thank you Indah! Yes it is a real popular appetizer at the parties.